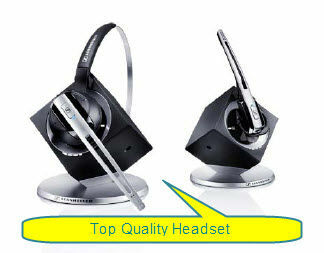 Sennheiser DW Office (DW 10) Quality Wireless Headset. Get excited by the all new single-ear DECT headset from Sennheiser Communications. This elegant office solution places a premium on comfort—to enhance whatever you do. Because your comfort is our concern, this headset lets you meet and move around freely without any wires to hold you back. You’ll also warm to the high-end sound quality, personalized wearing styles, functional design, simplicity of use—and lots of talk time. For true comfort calls, we’ve also ensured that you get a safe, high-quality headset which protects you from acoustic shock, and supports both existing and new technologies. DW Office not only sounds and looks great, it also comes with a whole host of productivity and communication - enhancing features that will bring a smile to your face. Desk phone & softphone – Use on both your telephone and your computer (softphone). Switch from one to the other with one touch on the base station. Ideal for those making phone calls via normal landlines and Skype. Range of Electronic Hookswitch (EHS) cables to suit many modern phones. Fast charging 50% in 20 min.